Ahoy there mateys! I received this murder mystery eARC from NetGalley in exchange for an honest review. So here be me honest musings . . . I have been avenged and vindicated! I finally, finally got me grubby mitts on this here correct book! For those new to me crew, a while back I suffered immense confusion and shock when I picked up a book expecting to find a time-travel fantasy and there was no time travel to be had. 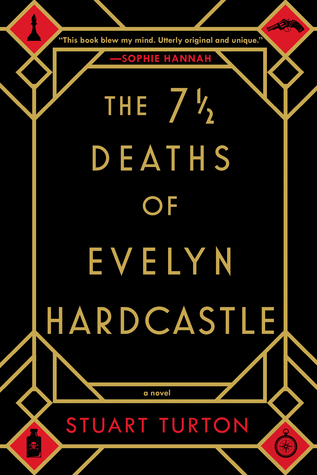 What I had meant to read was this book, called the seven deaths of evelyn hardcastle. What I got instead was a book called the seven husbands of evelyn hugo – a wonderful historical fiction about the golden age of Hollywood with a LGBT twist! Similar titles hence the confusion. Side note: Liz Laurin on Goodreads asked the author “Always been curious since I love both books, is the name any sort of homage to The Seven Hsubands of Evelyn Hugo, or just a weird coincidence? There wouldn’t seem to be any sort of connection as they are very different books, but I LOVE both.” His glorious response, “Complete coincidence – that’s why we had to change the US title to 7 1/2 Deaths.” Ha! While I was delighted by the mischance, I did want to read the correct book. It was described to me as Agatha Christie meets Groundhog’s Day. Fun stuff! And goodness did this yarn deliver. The main premise is that a man named Aiden Bishop has been doomed to repeat the same day over and over – the day that Evelyn Hardcastle is murdered at a gala party thrown by her parents. The only way he can escape this dastardly day is if he can solve who murdered Evelyn and how. But after hundreds of repeats of the day in question, is Aiden really any closer to discovering who-dun-it? Basically this work be a genius of craft and cunning. The complexities were many and the puzzles fascinating. And I loved it. I am in awe of the planning and vision of this work. Me noggin spun pleasantly in possibilities while readin’ it and spun satisfactorily in circles upon finishing it. It is a book that deserves a second readin’ now that the puzzle pieces have been revealed to me. Because now that I can see the pieces, I want to take another look at how the parts interlocked from the beginning. I will certainly be readin’ Mr. Turton’s next book. I still recommend that the crew reads about evelyn hugo. But I also recommend that me crew picks this one about evelyn hardcastle up too! Savvy? I really enjoyed this read and loved all the twisty puzzles. I was completely shocked by the ending! I too get this one confused with Evelyn Hugo, which I haven’t read yet. Some day! I was so impressed by the organization and storytelling. It was an excellent read. Thanks for visiting! I love the sound of this one, Cap! And I’m also intrigued by the book you also acquired by mistake! Thank you for the heads-up. I’m still busy trimming down my teetering TBR – but once it’s a bit more respectably slim, this is definitely one of the books I want to top it up with, againj. Aye matey. Both of these books must go on yer list. Well written and delightful. I love readin’ all reviews of them too. Can’t get enough. Arrr! Thank you for the recommendation, Cap! Why have I never heard of this book before?! It sounds WONDERFUL. Thank you for locating the correct book and reviewing it so I can be introduced, Captain! Your review totally hooked me. Out of curiosity, which of these 7 ___ Evelyn books do you enjoy more? Can’t believe ye missed this one and very glad to point ye towards it. Personally I liked the Hugo book better. It actually may become me best book of the year. I just completely connected with the characters and it had beautiful writing. The Hardcastle book was also well written and clever but I felt like I was watching from overhead or offstage. So while the puzzle and story were wonderful, I was never fully invested in the main character. That said I loved them both and have no regrets. Ye gonna give both a shot? I am definitely going to give both a shot! I love historical fiction and I’ve really been in the mood for more of it lately. The Seven Husbands of Evelyn Hugo sounds like what I am craving. That said, the idea of a Groundhog’s Day mystery really intrigues me. Did feeling detatched from the story affect your overall enjoyment, or just your ability to attach to the main character? I ask because I find being distant during mysteries is an experience I almost always have. I’ve never considered it closely before! Hooray for giving both a shot! I believe that seven husbands is going to be me favourite book of the year even if me blog be for fantasy, sci-fi, and young adult. I just can’t stop thinking about it. I have to admit that feeling detached did affect me overall enjoyment a bit. I like to be sucked into a story and forget I be readin’ one. So I always knew that I was readin’ seven deaths. This does happen to me with almost all mysteries (an exception isn’t coming to mind). It is why most mysteries are one-time reads. Not because I know the endings (I tend to forget details anyway) but because I don’t attach to the characters. I read mysteries when I have to focus on multiple things at once so if I miss something, it usually doesn’t matter. Hope that makes sense. Arrr! That’s HIGH praise, Captain! Now I definitely have to read Seven Husbands. Immediately. I agree with you when it comes to mysteries. For some reason, I can never get completely lost in the story. I don’t know why! It might be because the characters aren’t the focus — the mystery, and threfore the plot, is! I would rather focus on characters and relationships than plot. Hope ye enjoy Seven Husbands as much as me and the rest of the crew did. Arrr! Ye should check it out it is fun! Thanks kindly for the comment and for readin’. I was wondering about the difference in titles! I actually just started this book yesterday — so glad to see your positive review! Glad I could clarify all the confusion of titles! A fun but twisty mess that be. I hope ye love the book. I can’t wait to read yer review! Haha that must have been rather confusing! Glad you finally got the right story and enjoyed it. 😀 My brain was on fire trying to fit all the pieces together. And I would also like to do a reread at some point, now that I know all the answers. Thanks for taking the time to read me musings. I didn’t really relate to the characters like I normally do since I felt like I was watching from above. But me noggin enjoyed the puzzle of it all. I am so excited to read this book! It sounds amazing. It is super fun and thought provoking. Hope ye love it! I loved it! Thanks for readin’! That’s a funny story about the titles of the two books, I was wondering the same thing😁 I have this on my plate to read as well. I am glad I provide entertainment and I also be glad that ye are going to check this one out. It is worth the time.